You will most probably visit the old town of Tallinn when you arrive. It is so irresistibly lovely with its own special charm. There is more to Tallinn though, and once you leave the old town there are some more cool places to see and explore. One of the coolest places to hang out in Tallinn. Not far from the train station, a set of old factory buildings was converted into a cool creative hub. I like the idea of converting old industrial buildings and giving them a new life. Artists have their studios there, design lovers will easily get their fix there and as you might expect there are more than enough bars and restaurants all around. There’s a lot to discover around Telliskivi. The area is big enough to stroll around for a couple of hours, but at the same time feels welcoming and almost cosy. There are some magnificent murals, an open air exhibition and lots of unique shops, especially elegant design and fashion stores and some selling organic and fair trade products. It’s Tallinn’s trendy place right now, and some call it hipster. Have a look at their website for updates on events, theatre, comedy, music and the weekly flea market. When I reached the Contemporary Art Museum of Estonia, I knew nothing about it. The name sounded very formal, but the logo at the entrance had the aesthetics of an anarchist flag. A quick chat with the friendly lady at the desk inside revealed that this was in fact a squat. Nobody is living there; it’s a squat used as an art gallery. A group of artists decided to take an abandoned building and use it to display contemporary art. Now it’s been around for about 10 years and according to the friendly lady there was no risk of evacuation, as this is now a local cultural asset (and part of Tallin’s Cultural Kilometre). It’s free to enter (you can leave a donation) and you should expect a thought provoking exhibition inside, spread over several floors. They also have a cafe and a bookshop and run some music events from time to time. Kalamaja is a beautiful part of Tallinn, not far from the centre. You can reach it on foot from the old town or just go to the Baltic train station. 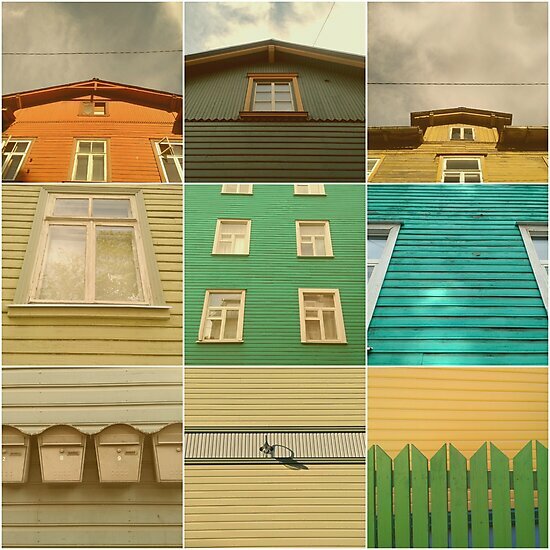 One of its unique features is its old wooden houses – dozens of them, painted in different colours and most of them in a very good condition. I took a walk around there a few times and found it beautiful and relaxing. Have a look at some more photos from Tallinn here. Right outside the train station, there is a covered market that’s worth a visit. It’s a food market on the first floor and a fashion, design and antique market on the second floor. As you enter, you’re surrounded by fruit and vegetables stalls, and as you walk inside, you’ll find a huge selection of food stores, cafes and food stalls. For vegans there are two great places to eat there: Veg Machine and Toormoor (check out my vegan guide to Tallinn for more). The second floor is famous for its antique stores. It has some stylish vintage shops, Soviet souvenirs and all sorts of quirky things, from old toys to musical instruments to vintage glassware. Next to the antique market on the second floor there’s a pretty standard clothing market and then some trendy designer shops. Tallinn is a harbour city by the Baltic Sea, which means you can take a walk by the shore of the Gulf of Finland. There’s a lovely promenade there, perfect for a sunny day, and if you walk a little further you will get to the beach. This part of Tallinn is a little bit outside the centre, but as the city is quite small, it’s not that far. You can reach it on the bus in about 15-20 minutes. I take walking tours in almost every city I go to. This is was especially fun. Our guide was very entertaining and explained everything, even the less appealing historical facts, with a great deal of humour. Once you’ve heard the story of the city from a local, you start to appreciate the unique blend of Eastern European and Nordic influences in Tallinn. It’s different to any other place I’ve ever been to. When you visit Tallinn, I recommend you stay in the Old Town / city centre. Tallinn is small and walkable, and staying in the Old Town means you can reach all the city’s points of interest on foot easily. Accommodation in Tallinn is quite affordable and there’s a nice range of hotels and vacation rentals in the centre of Tallinn. Medieval Bishop`s House Apartment is a beautiful, budget-friendly apartment to rent in the city centre, right in the Old Town. Check availability here. Centennial Hotel Tallinn is a modern hotel with an in-house restaurant. It’s at a convenient location, a short walk from the historic Old Town, and offers large, clean and modern rooms. Book a room at Centennial Hotel. For a luxury experience at surprising Estonian prices check out The Three Sisters Boutique Hotel. It’s at a perfect location in the Old Town of Tallinn and you’ll be staying in one of the typical historic buildings of the Old Town, but with stylish modern decor. Click here to check dates and rates. Tallinn is a good base for day trips in Estonia and also for a trip across the water to Helsinki, which is quite close. If you like coastlines, cliffs and history, head to Paldiski in Northwest Estonia. Historically a Soviet naval base, it now offers some beautiful nature and architecture to enjoy. Find out more details about this day trip here. The oldest and largest national park in Estonia, is a nice day trip from Tallinn for lovers of forests, waterfalls and scenic walks in nature. Find out more here. This is probably the most popular day trip from Tallinn. Helsinki (Finland) may seem a bit far, but the day trip is perfectly doable by taking the morning ferry. It takes 2.5 hours to reach Helsinki. To make the most out of the city in one day, you want to take a guided tour (this one includes the guided tour and the transportation in one package deal). Tallinn is probably one of the most lovely towns/capitals I have visited. Everything is perfect there. Unfortunateky I’ve been there for one unic day as part of a cruise but this made me wish to return with no doubt.